It is only natural that most of us would jump at the chance to enjoy a chance to step back, not only to our childhoods, but back in time as well. An elegant tea party can be a simple, under-stated affair, or grand and opulent, depending on your own tastes, time constraints, and guest list. Let’s jump right in and start sorting through the basics that you will need to consider in order to make your tea party a smashing success. The first thing you need to determine are the types of food that you wish to serve. Many other choices, such as tea selection and china, cannot be made without first knowing the menu. Are you planning a dessert tea, brunch tea, afternoon tea, or something less formal? A dessert tea or sweet tea will typically have several choices of cookies, bars, and even a layer cake with frosting. A brunch tea will include a few savory and sweet selections. Quiche, muffins, scones, and tea sandwiches are all popular. 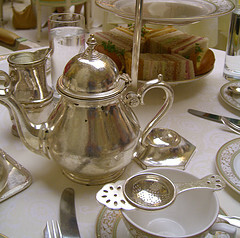 Afternoon tea will serve scones, savory foods and tea sandwiches, and then sweets, in that order. 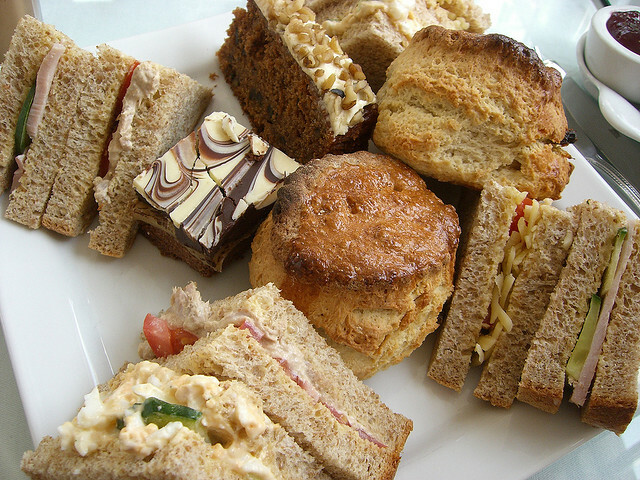 Your food does not need to be homemade, many supermarkets offer pre-made foods that would be delicious at a tea party. Think about the amount of time that you have to spend on cooking, and maybe choose a few items to make from home, and purchase the rest. The tea that you serve at your party will be mostly influenced by your food selections. If you are only serving sweet desserts, white or green tea is your best choice. If you are serving any savory foods, black and oolong tea may be served, along with white and/or green tea. Having several different choices for your guests is the best option, and throwing in a few herbal selections like chamomile and peppermint will tickle the taste buds of your younger guests, as well as any adults who may not particularly care for traditional tea. Sugar cubes, lemon wedges, cream, and milk should also be set out for your guests to ‘dress’ their tea to their own tastes. When gathering the china for your tea party, consider how many types of tea you will be serving. If you are serving three types of tea, at least three large teapots will be needed. If you are having a large number of guests, consider 2-3 teapots per type of tea. A few carafes filled with hot water will also prove useful if any of the pots become low, a guest can make a cup of tea using the hot water and a tea bag. Teacups and saucers will need to be provided. One and a half teacups per guest will ensure that you don’t run out of clean cups. Most guests will simply refill their original teacup, but some may opt for a new cup. If you do not already have all of the china needed (and most of us do not!) start visiting thrift shops a month or two prior to your event. Many times, single teacups and saucers may be found inexpensively. If you don’t mind the mix-n-match look, this is a great way to save money! You will need a collection of tablecloths, cloth napkins, and a few doilies for a well-laid table. If you are aiming for the most elegant setting, opt for white linen; otherwise, other colors and prints are acceptable. Traditionally, your cloth napkins should be twelve inches, provide one and a half napkins per guest. A few well-placed doilies, table-runners, and decorative napkins set under serving dishes and teapots will complete your linens. Flowers for your elegant tea party need not be extravagant. If you have flower gardens at your residence, cuttings will do nicely. One vase of cut flowers displayed on the serving table is entirely sufficient. If you want to use more flowers, a few bud vases placed strategically around the room, as well as in the powder room is a lovely touch. If you are purchasing flowers from your florist or supermarket, choose one or two stems of a larger flower like lilies, three roses, and some filler flowers like baby’s breath, German statice, or Queen Anne’s lace. Music may seem like a tiny detail, but leave it out, and you will be missing out on the ambience that well-chosen classical music can provide. Classical music will alert your guests immediately upon arrival that your tea party is an elegant, classy affair. If you already have favorites, be sure to include them in your playlist. It is also important to include selections that your guests may be familiar with as well. Selections like: Beethoven’s Moonlight Sonata, Fur Elise, and Claire de Lune, Pachelbel’s Canon, Greensleeves, and Brahm’s Lullaby. Start playing the music softly before your guests arrive, but adjust the volume as more arrive. You want the music to be audible, but not so loud that your guests cannot hear each other speak. Hosting your first tea party can feel overwhelming at first, but nailing down the details listed will give your party structure, and you will have a plan that will keep your stress levels low. Enjoy adding some culture into your life, and the lives of your guests. Remember the joy of your childhood tea parties and recreate that same feeling as an adult.